All three of the OpenNet Initiative's edited volumes—Access Denied, Access Controlled, and Access Contested—are available online. 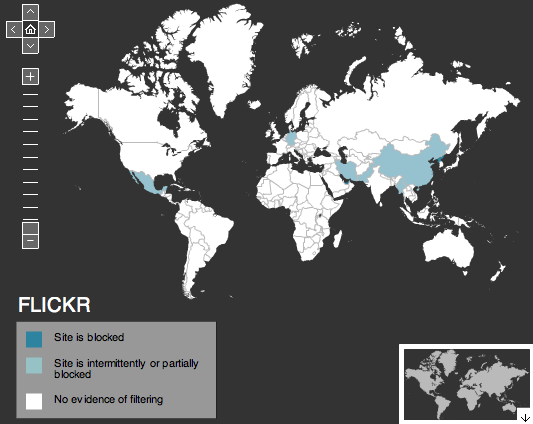 The OpenNet Initiative's summarized global Internet filtering data is available for download under a Creative Commons license. ONI's main filtering map shows the states and regions where each type of filtering ONI studies takes place. Our social media map serves as an easy visual guide to the states and regions where filtering of five major social media sites occurs. For a detailed look at when and where YouTube has been filtered since 2006, check out YouTube Censored: A Recent History, ONI's interactive global timeline. In In the Name of God, ONI analyzes the Internet censorship policies and practices of majority Muslim countries and finds that in many of these countries online information controls are primarily based on the Islamic faith and interpretations of its instructions.